We saw the models awhile back, we got the rules and they're gold. It you're enjoying Fire Eaters, expect to enjoy these dudes. I'm enjoying this RAT6 trend as well. The only concern I have is how excited everyone but Circle is about them. Free boosted Ravagore shots, boosted incindiarii damage rolls are all well and great. For them. I'm actually very surprised they're metal. I wish they weren't, honestly. Would keep the 70$ price tag out and drop it maybe to 50$. No luck though. There's three sculpts, and a leader. Leader being on the far left with the open mouth. The left sculpt is throwing bombs, the middle is throwing spears and the right column has spears held at ready. Everybody comes with the exact same quiver. The leader has the torch and the only arm with a spear that's different of the four. Pretty simple. Mold lines aren't that bad. Noticeable in a few places but not horrible. The Bomb guys have the throwing arm, a balancing arm and of course, quivers. They were probably the biggest pain because of the sprue the bomb arms come on and having to sand that down. On the plus side, the worse part of the seam goes in the socket, but it's still a little bit of work. The aggressive looking guys of the bunch, the spear chuckers, are one piece except for the quiver. The hood has a mold line, and check the insides of the legs, they have mold lines as well. Last but not least, the en garde dudes. Overall, not bad. Pretty pleased with them. I'm going to run with a poison dart red/white scheme. Probably gesso prime them to give them a texture, paint them and then gloss varnish most of the model after sealing it for that wet frog look. I'm currently painting the bases, then will start filling them with grass and water effects before painting the frogs and gluing them on. Because of the nature of the bases, I'll have to match each model individually to a base and then keep track. It's not hard to get a good pose since you can bend the metal, but you want to do that before you paint, not after. Order of Activation issues as always. That's where we're at. Nothing complicated. Nothing like Warders or Highwaymen. Check back to see how these guys turn out. Otherwise, there's still a Thyron Commission, as well as a Ruin Commission, the Witch Coven and now a Druid Wilder (for fun.) Lots going on. 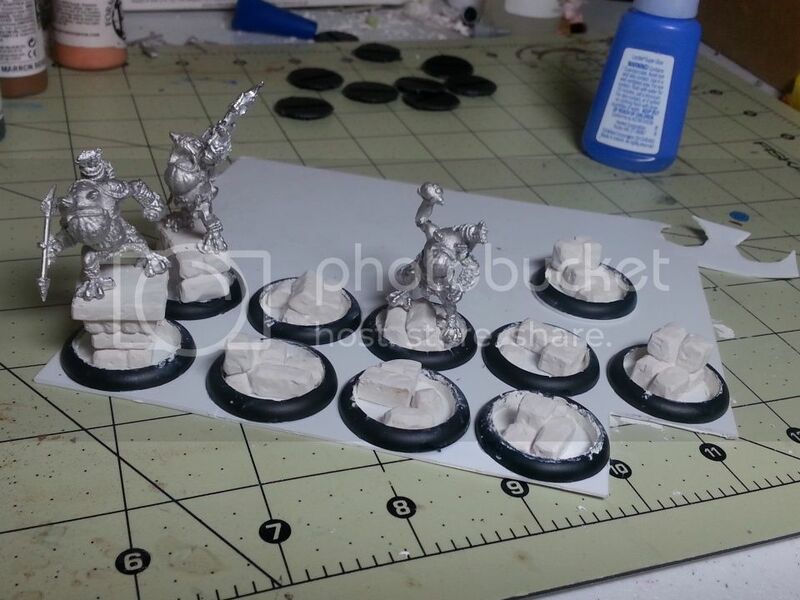 I also got ahold of the base from the 100yr anniversary Hordes set, so I'll paint that eventually too.